The baptism of Jesus was seen by some Adoptionists as the moment in which Jesus became God's Son. Adoptionism is a minority Christian belief that Jesus was born merely human and that he became divine—adopted as God's son—later in his life. By these accounts, Jesus earned the title Christ through his sinless devotion to the will of God, rather than be his pre-existent status as the eternally begotten Son of God. Adoptionists typically portray either Jesus' baptism or his resurrection, or both, as the key moment(s) in the process of his divinization. Adoptionism arose among early Christians seeking to reconcile the claims that Jesus was the Son of God with the radical monotheism of Judaism, in which the concept of a trinity of divine persons in one Godhead was unacceptable. Adoptionism was common before it was first declared heresy at the end of the second century, and persisted for several more centuries and re-emerged at several points in church history. Some scholars see Adoptionist concepts for example in the Gospel of Mark and in the writings of the Apostle Paul. Adoptionism, however, contradicts the identification of Jesus as the divine Logos, as put forth in the Gospel of John (1:1). Adoptionism was condemned by the church as heresy at various times, including at the First Council of Nicaea, which set for the orthodox doctrine of the Trinity and identifies Jesus as eternally God. Adoptionism is one of two main forms of the doctrine which has come to be known as Monarchianism, the other is Modalism, which regards "Father" and "Son" as two aspects or modes of the same Being. Adoptionism, also known as Dynamic Monarchianism, denies the pre-existence of Jesus as the Christ although it does not necessarily deny his ultimate divinity. In Adoptionism Jesus became divine at some point during his earthly life. Adoptionism was one position in a long series of Christian disagreements about the precise nature of Christ, a subject known in theology as Christology. In the developing dogma of the Trinity, Adoptionism represented an attempt to explain the relationship between Jesus of Nazareth, and God the Father, while maintaining Christianity's monotheism. The Adoptionist view may date back almost to the time of Jesus. In academic circles some consider both the Apostle Paul and the Gospel of Mark to have Adoptionist Christologies. Jesus appears to be a mere human until a dramatic event or process changes him into a divine being. 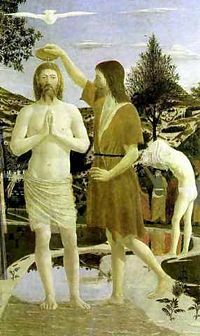 In Mark 1, Jesus is baptized by John the Baptist for the forgiveness of sins. God then declares him to be his Son. In Paul, Jesus is born as any Jew, under the law, but becomes divine after his resurrection. Orthodox Christians, of course, do not concur with this interpretation of Mark's and Paul's writings. "Jesus was either [a] regarded as the man whom God had chosen, in whom the Deity or the Spirit of God dwelt, and who, after being tested, was adopted by God and invested with dominion; or [b] Jesus was regarded as a heavenly spiritual being (the highest after God) who took flesh, and again returned to heaven after the completion of his work on earth." Historically, there were three waves of Adoptionist belief, excluding the earliest Christians of whom we have no definite record. The first wave, which dates from the second century, differs significantly from the subsequent two, dating respectively from the eighth and the twelfth century, which respond to the definition of the Trinity and Chalcedonian Christology. Adoptionism was declared heretical by Pope Victor I in the late first century. The first known exponent of Adoptionism in the second century is Theodotus of Byzantium. He taught, according to Hippolytus of Rome, that Jesus was a man born of a virgin, that he lived like other men, and was most pious. At his baptism in the Jordan the Christ came down upon him in the likeness of a dove. Only after this could he perform miracles. The belief was declared heretical by Pope Victor I (last decade of the second century C.E.). The widely read second-century work Shepherd of Hermas also taught that Jesus was a virtuous man filled with the Holy Spirit who was later adopted by God. "When [the fleshly body of Jesus] had lived honorably in chastity, and had labored with the Spirit, and had cooperated with it in everything, behaving itself boldly and bravely, He chose it as a partner with the Holy Spirit; for the career of this flesh pleased [the Lord], seeing that, as possessing the Holy Spirit, it was not defiled upon the earth. He therefore took the son as adviser…" . While Shepherd of Hermas was popular and sometimes bound with the canonical scriptures, it never achieved canonical status, but is included among the works of the Apostolic Fathers. In the third century, Paul of Samosata, Bishop of Antioch, was a well known promoter of a form of Adoptionism. He said Jesus was a man who kept himself sinless and thereby achieved union with God. Among teachings ascribed to him were: "The Saviour became holy and just; and by struggle and hard work overcame the sins of our forefather. By these means he succeeded in perfecting himself, and was through his moral excellence united with God… " In 269 C.E., 70 bishops, priests, and deacons assembled at Antioch and deposed Paul as bishop, although he was able to retain his position for several years due to his political connections. "Paulianists must be rebaptized, and if such as are clergymen seem to be blameless let them be ordained. If they do not seem to be blameless, let them be deposed. Deaconnesses who have been led astray, since they are not sharers of ordination, are to be reckoned among the Laity." "As the Nestorian impiety divided Christ into two persons because of the two natures, so your unlearned temerity divided Him into two sons, one natural and one adoptive." Beatus of Liébana, from the Kingdom of Asturias, also fought this new wave of Adoptionism, which was a cause of controversy between Christians under Muslim rule in the former Visigothic capital of Toledo and the neighboring Christian kingdom. This manifestation of the doctrine was condemned as heresy by the Council of Frankfurt (794) under Pope Leo III. A third wave was the revived form ("Neo-Adoptionism") of Peter Abelard in the twelfth century. To Abelard, it was self-evident that the man Jesus of Nazareth was not the same being as the pre-existing eternal Son of God. One of the first great scholastic theologians, Abelard was far too clever to be trapped into any overtly Adoptionist statement, but some of his disciples went further. "Christ, as man, is the natural son of man," said one of them, "and the adoptive Son of God." 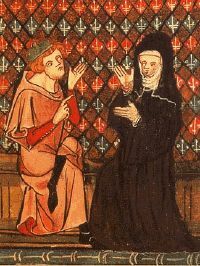 Abelard's Neo-Adoptionism was condemned, at least in its fundamental principles, by Pope Alexander III, in 1177. Later, there were further modified and qualified Adoptionist tenets taught by theologians from the fourteenth century. Duns Scotus (1300) and Durandus of Saint-Pourçain (1320) admit the term Filius adoptivus (adopted son) in a qualified sense. In the modern era the Jesuit Gabriel Vasquez (sixteenth century) and the Lutheran divines Georgius Calixtus (seventeenth century) and Johann Ernst Immanuel Walch (eighteenth century) defended the Adoptionists as essentially orthodox. Liberal Christian theology, especially the historical Jesus school, has been criticized as a type of Adoptionist heresy, in that it seeks to understand Jesus the man without emphasizing his eternal divine nature. Theologians such as Rudolf Bultmann typify this approach, teaching that Jesus must be "demythologized" in order to be comprehended by contemporary Christians. ↑ Adolf von Harnack, History of Dogma www.ccel.org. Retrieved August 15, 2018. ↑ Hippolytus of Rome, Philosophumena, VII, xxxv. ↑ The Shepherd of Hermas translated by J. B. Lightfoot. www.earlychristianwritings.com. Retrieved August 15, 2018. ↑ Harold O. J. Brown, Heresies The Image of Christ in the Mirror of Heresy and Orthodoxy from the Apostles to the Present (Garden City, NJ: Doubleday, 1984), 183. Adoptionism in Catholic Encyclopedia www.newadvent.org. Chapter XI. Doctrinal Controversies www.ccel.org. Christ Apostolic Temple, Inc. Fellowship (CATIF) www.christapostolictemple.org. This page was last modified on 21 August 2018, at 15:40.